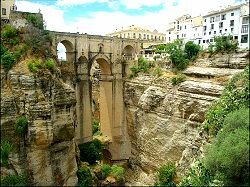 Ronda, famous for it's dramatic cliff top location and the 120m high arched bridge spanning a chasm in which the river Tajo flows, lies 30 Km inland from the Costa del Sol, western Malaga province. 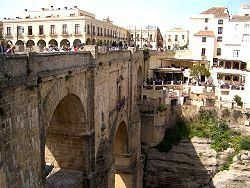 That bridge, known as the Puente Nuevo (New Bridge - two older and lower bridges still exit) was built in the 18th century, and yes, the height is 120m (around 400 feet). 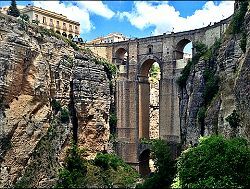 The present town dates back to Roman times but was greatly influenced by the Moors, many of whom retreated there after the reconquest. 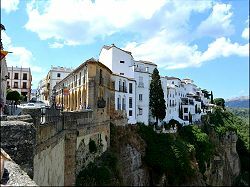 Although Ronda has grown in size, it still retains plenty of its original charm, and you will find plenty of tapas bars and restaurants there. 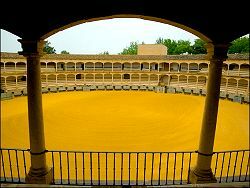 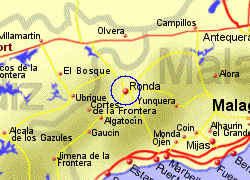 The area around Ronda is very much agricultural with a rolling landscape and mountains beyond. 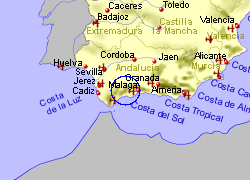 Map of the Ronda area.